Berkeley has seen it all. 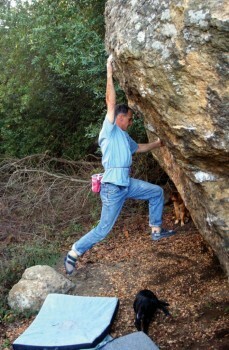 From old school soldiers in the war of gravity to modern day dreadlocked rock stars, they have all found many worthy challenges on the volcanic crags and boulders in the eucalyptus forests of the Berkeley hills. From the free belay evolution in the 1920s at Indian Rock to the free speech movement of the 1960s at UC Berkeley, all the way to the modern day free climbing movement of the 1990s at Mortar Rock, Berkeley has always been on the cutting edge. Some of the pioneers of rock climbing in Yosemite got their start and much needed practice on these small cliffs and boulders. Which SuperTopo guidebooks cover Berkeley?